Bushwalking WA > News Updates > A walk in the park? The Murchison Gorge in Kalbarri National Park, a 6-7 hour drive (485km) north of Perth, is well-known for its dramatic landscape, including natural rock features such as the famous Nature’s Window, The Loop, Z-Bend and Hawks Head, formed as the Murchison River carved deeply into the ancient red and white banded sandstone. The Kalbarri Skywalk above the Murchison Gorge will doubtless become a key drawcard for tourists and other visitors after construction is completed in mid-2019. But the truly outstanding, world-class attraction of the Park, for the most adventurous bushwalkers / hikers, will always be the epic 38km walk through the gorge from Ross Graham Lookout to The Loop (or about 55km if starting further upriver from Hardabut Pool). Many walkers have been back to do this walk several times, such is the magical experience it offers and never fails to deliver! Not surprisingly, walkers typically make progress of only about 9km per day through the gorge. But why hurry when the scenery is exquisite? There is so much to explore, plus many options for riverside campsite locations, including at the beautiful ‘Little Z’. The full walk typically takes 4 days (or 6 days from Hardabut Pool), though the sections from Ross Graham Lookout to Z Bend or from Z Bend to The Loop can be done as shorter two-day walks, then requiring lighter packs. 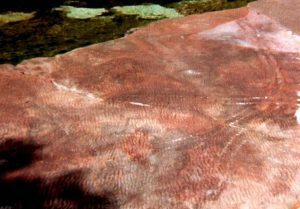 The observant walker will find that the sandstone rocks of the gorge are rich in fascinating signs of ancient, Paleozoic life. Abundant trackways of trilobites and eurypterids, and burrowing organisms are preserved as trace fossils in the rock layers; sometimes so perfectly that the tracks look as if they were left only yesterday, not over 400 million years ago! Walkers should also keep an eye out after dusk for the very elusive Black-flanked rock-wallaby which was thought to be locally extinct until re-discovered among the rocky outcrops by a rock climber in 2015. The remnant population has since been supplemented by females sourced from the wheatbelt region in the hope it will survive and increase. A much more likely, but less welcome sight in the gorge, are the resident feral goats which compete with the native fauna for resources such as food, water and shelter; thankfully Parks and Wildlife Service periodically conduct intensive control programs to reduce their numbers. Help preserve this unspoilt wilderness environment by applying the ‘carry-in, carry-out’ principle and leaving no trace: Those aluminium cans so carefully buried in the sand will likely be found unburied downriver by the first group to walk down the gorge after the usual winter floods. The best time of year to do the walk is around late winter after the river flow has eased and when fresh rainwater can usually still be collected from rock pools and puddles, before the warmer weather arrives. But walkers need to be aware of the risk of flash flooding which can occur following thunderstorms in the upstream catchment (e.g. flash flood experience at Z Bend). 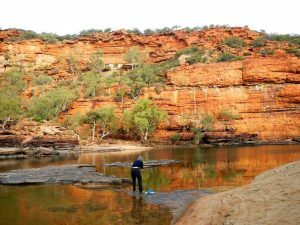 The Parks and Wildlife Ranger in Kalbarri is the best source of information on safely walking in the gorge. 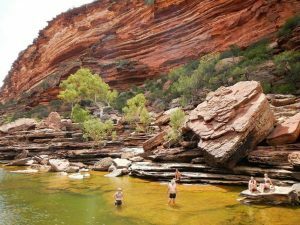 Before heading to Kalbarri, check the Parks Alerts System for possible park or road closures, and make sure your group’s leader notifies a park ranger before and after completing your hike. 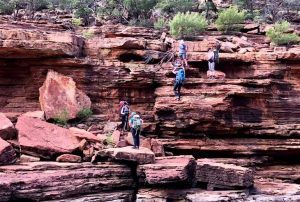 Walkers lacking experience, but keen to do the walk, should consider the benefits of firstly joining a club, such as Perth Bushwalkers Club, with a long tradition of walking the Gorge almost annually. 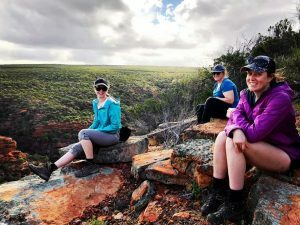 Walkers seeking an alternative easier, on-track day walk could opt for the 8km Loop Walk (see Trails WA) which includes a visit to Nature’s Window, framing the Murchison River valley. 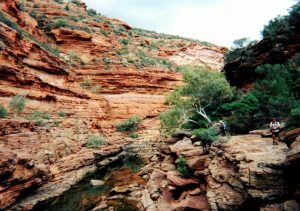 For additional information on Kalbarri National Park, its sites and facilities, see ‘Explore Parks WA’ (Parks & Wildlife Service). Acknowledgement: Most of the photos on this page and several on other pages of this website were kindly provided to BWA by Joey Curry, Julie McGinnigle and John Rowe, following their own epic walk through the Gorge in 2018, led by intrepid BWA Board member, Ras Gill. 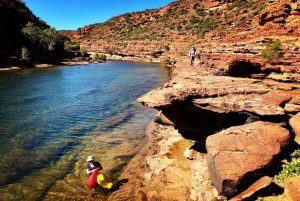 A sublime campsite at Little Z In the Murchison Gorge, Kalbarri National Park.